What prevents the use of a multi-segment ILS for non-straight approaches? 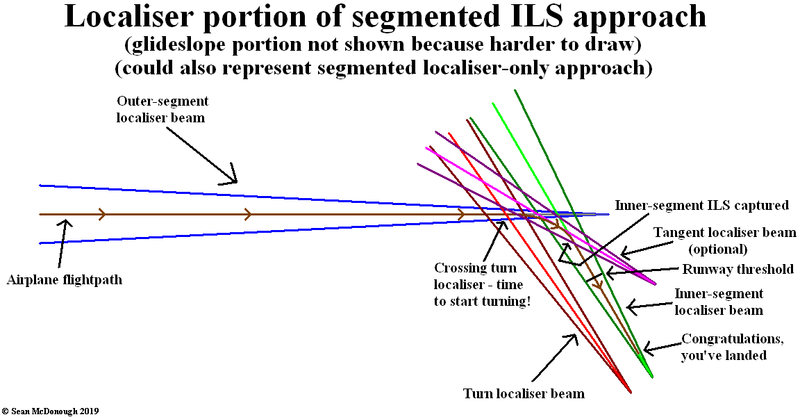 An ILS, consisting of a localiser beam to provide lateral guidance (which can also be used on its own for a non-precision approach) and a glideslope beam to provide vertical guidance, is (currently) indispensable for precision approaches in IMC, but comes with a few disadvantages. ...and sometimes because someone else is using part of the airspace in question (for instance, the four major airports in the New York area [JFK, la Guardia, Newark, and Teterboro] have numerous intersecting approach paths, which, as the approaches can’t be bent or segmented to keep out of each others’ way, frequently forces la Guardia and Teterboro to land aircraft on runways with strong crosswinds [because the ILS approach paths for their more optimal runways would risk causing MACs with aircraft on ILS approaches into JFK and/or Newark]; on the other side of the continent, the approach paths coming into LAX from the east pass near or over Ontario, which has caused quite a number of near misses in the vicinity of the latter airport). It doesn’t seem, conceptually, like it should be too hard to break up an ILS approach into two or more segments, each with its own localiser and glideslope, and with the beams from the pre- and post-bend segments intersecting at the bend in the approach path. As most aircraft are unable to turn on a dime, they would need to start turning a bit before the bend in the approach, but this could be easily handled by having another instrumental aid (for instance, a third localiser) indicate when to start turning; if the bend in the approach were sharp enough for the aircraft to have trouble locking onto the post-bend beams, another localiser and glideslope, with their beams tangent to the midpoint of the turn, could be used to assist the aircraft round the bend. All of this would also work for segmented localiser approaches, with the added advantage of being easier to implement (no need for the multiple glideslope antennae, just the localiser ones). Why aren’t segmented ILS and localiser approaches used in practice? See here, pages 5-23, 5-24. Things have advanced well beyond ILS for that kind of approach. To attain the benefits of RNP approach procedures, a key component is curved flight tracks. Constant radius turns around a fix are called “radius-to-fix legs,” or RF legs. These turns, which are encoded into the navigation database, allow the aircraft to avoid critical areas of terrain or conflicting airspace while preserving positional accuracy by maintaining precise, positive course guidance along the curved track. The introduction of RF legs into the design of terminal RNAV procedures results in improved use of airspace and allows procedures to be developed to and from runways that are otherwise limited to traditional linear flight paths or, in some cases, not served by an IFR procedure at all. Navigation systems with RF capability are a prerequisite to flying a procedure that includes an RF leg. Refer to the notes box of the pilot briefing portion of the approach chart in figure 5-17. The Approach in Fig 5-17 has 5 turns left & right! For the same reason the basic answer is no to the question "Can two opposite localizers to a single runway be on simultaneously?" The installation will be more expensive than the additional antennas due to the extra validation required to ensure that there is no signal interference. Not to mention a curved path approach typically means there is high terrain around – localizer arrays require flat areas ahead of them, otherwise signal reflection will make it unusable, this is one of the areas MLS focused on. Assuming it was deemed technically feasible, then operationally it is far from being straightforward. Changing frequencies and set CDI courses multiple times during approach will preoccupy the pilot monitoring, taking away from their duties. And if it were to be automated, then this will call for new single-purpose airborne equipment and with it comes new costs and training. This is all solved by RNP, in particular the AR kind (authorization required) that has radius-to-fix (RF) curved segments. 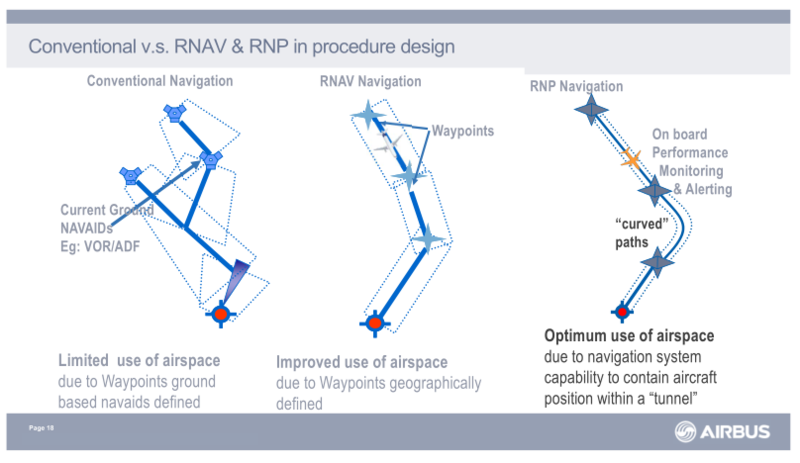 Historically, MLS (bottom illustration) was supposed to provide curved path approaches, but then GPS came along and with it the cheaper terminal area RNAV/RNP applications. Even if it were technically possible to have a multisegment ILS approach, the economics just don't make sense. Each ILS costs millions to install and millions more to keep running properly over its lifetime. You need a lot of traffic to justify that cost. Now multiply that by however many segments you need, and then consider whether an airport that hard to get into is going to have enough traffic to justify that enormous cost. OTOH, RNAV approaches can have any number of waypoints along an arbitrary path; they can even have curved segments between waypoints. There is no ground equipment that needs to be installed or maintained, just the one-time cost to develop the procedure, so it's orders of magnitude cheaper despite being more capable. Not the answer you're looking for? Browse other questions tagged approach ils localizer or ask your own question. What is a SAAAR / RNP AR instrument approach? How do pilots fly an MLS approach? How precise is an ILS (Instrument landing system)? What's the preferred approach for a passenger jet? Precision Approach systems: Why is ILS used more frequently than PAR and MLS? Does ATC provide ILS frequency and course setting for the runway in use? How do pilots estimate glideslope visually without PAPIs? Can crews hand-fly an RNP AR approach in IMC? Did Kai Tak have a straight-in approach to runway 13 for higher-performance aircraft?